The price of the Realme U1 in India has been reduced. Both their 4gb and 3gb variants got a price cut and were announced on their Real e-store and Amazon India. Amazon listed an exchange offer and a no-cost EMI option. The phone was released last November, it has a waterdrop notch, a dual camera rear setup, and a rear fingerprint sensor. The phone also comes with a MicroSD card, has a 6.3-inch display, and has the MediaTek Helio P70 SoC. The 3GB RAM + 32GB storage variant is now for sale at Rs. 10,999 and the 4GB RAM + 64GB storage is now for sale at Rs. 13,499. Originally the 3GB variant costs around Rs. 11,999 and the 4GB cost around Rs. 14,499. Realme is currently offering Rs. 1000 discount on both variants. 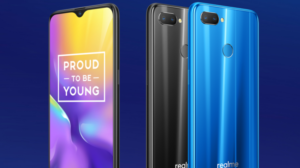 Both variants are for sale on the official website of Realme and Amazon.in. An offer has also been listed where buyers will get an Rs. 2500 cashback and Cleartip Cashback under the Jio Realme Thunder offer. Realme e-store is currently giving a 10 percent cash back, this means you can get Rs.1000 cashback if you pay through Mobikwi, and Jio is also offering 4.2tb 4g data that is worth Rs. 5,750. The Realme U1 is a dual-SIM nano phone that runs on Android 8.1. It has a 6.3-inch full-HD+ (1080×2340 pixels) LCD display that has a 19.5:9 aspect ratio. The smartphone has an octa-core MediaTek Helio P70 SoC 2.1ghz processor, with an ARM G72 GPU, and 3GB or 4GB RAM variants. The Realme U1 has a dual rear camera setup that has a 13-megapixel as its primary sensor with an f/2.2 aperture and for its secondary sensor, it uses a 2-megapixel camera with an f/2.4 aperture and an LED Flash. The phone also has Slow Motion Videos up to 90fps, Bokeh Effect, AI scene detection, and Portrait lightning. The Realme U1 also equips an AI Face Unlock security feature. The Realme U1 has a 25-megapixel Sony IMX576 sensor that has an f/.20 aperture as its front camera. The phone has up to 64 GB internal storage that is expandable if you add a microSD card. The phone also has a fingerprint sensor in its rear panel. The phone has a 3,500mAh battery. The phone weighs 168 grams and has measures of 157x74x8mm.